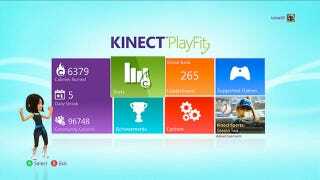 Microsoft has launched an application called Kinect PlayFit as a free download for all Xbox Live members, the publisher said today. Kinect PlayFit is a "new fitness dashboard that aggregates and tracks the calories you burn as you play a variety of Kinect games," Microsoft says. You'll be able to compare your stats to other people via leaderboards and earn Achievements, Gamerscore, and Avatar Awards based on how much you accomplish. "Kinect PlayFit inspires an active and healthy lifestyle through fun and play," Xbox Live's Larry "Major Nelson" Hryb wrote on his blog today.